It has been alleged that female students are living in a hostage life in various privately ventured women hostel. Hostel authorities are harassing students by increasing rent, meal charge and other relevant fees without any reasons. A pang of death situation is prevailing in the hostels for gas, water crisis along with low standard food. Many victims said, they have to pay fine if unable to pay rent and other charges within the stipulated date of 5 every month. In addition, if failed to pay house rent within the 20th day of month they are forced to leave hostel. Same situation is persisting in the most of the women hostel of Dhaka. Apart from that, in the working women hostel, there have endless sufferings. Women have to endure various autocratic decisions of mess owners without any protest. Sometime, the female students raise their sound against suppressive decision of house owners but fall flat. The suffering become augmented in the month of May to November as around 50 thousand students arrive to Dhaka to attend coaching for University and Medical examination. These women hostel turned to the lone reliance for those students and hostel owners are using the opportunity. According to the allegation, Nibedika women hostel has larger number of branches. In the green road, there have three branches of Nibedika hostel. These hostels are controlling from the 114 no road of Green Road. In the beginning of this month, agitated students protested against the decision to increase charge and fees and they breakdown the television and fridge of hostel in charge bur in vain. Whenever asked about the claim, Shumi Akter, in charge of the room refuted the allegations. 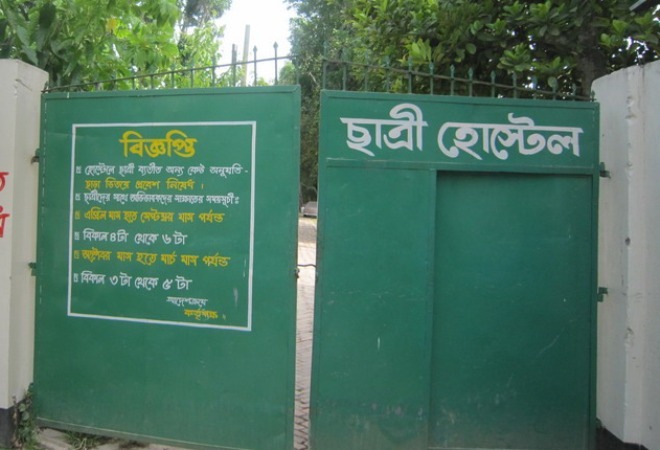 According to the information, Monipuripara, Green Road, Panthapath, Khamarbari, Mirpur, Azimpur and various areas of Kamlapur are famous of privately ventured women Hostel. Along with Nibedika student Hostel, Sadia, Rongon, Apan, Karnophuli, Ma Homes, Uttarbanga, Jui and more 150 students hostel are renowned in Dhaka.